L-R: Travis Buck, Dan Corkery, Sara Vanderpol, Randy Brassard, and Johnny Edwards. 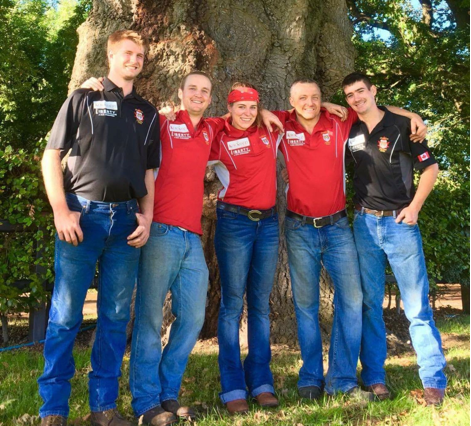 Travis Buck, Dan Corkery, Sara Vanderpol, Randy Brassard and alternate Johnny Edwards arrived in Birmingham, England this past September for the 37th International Horse Shoeing Championships. We spent three days at Derek Gardner’s shop in the Lake District, where horses were brought in each day for practice runs. Before starting, Derek went over the feet with each team member. He also checked our trims, fits and final jobs – using the same format as Stoneleigh. Derek strives for clean lines and a balanced trim/shoe and our specimen shoes were fine-tuned by the time we left. Derek’s attention to detail is impeccable. 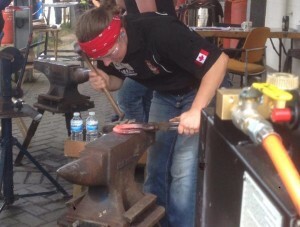 Competing at the 37th International Horse Shoeing Championships was exhilarating. It was the completion of a summer that was, at least for me, chaotic and challenging. The team is a big commitment – you work harder in order to not let your team mates or country down. The four of us split into partners to complete the pairs classes. The forge consists of 8 stations and the horses face away from us in the cross ties. We competed in good company between our neighbors, Scotland and Ireland. 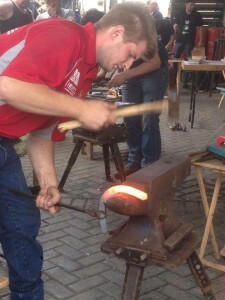 The forge was so crowded that tools were occasionally used during the contest by opposing teams! 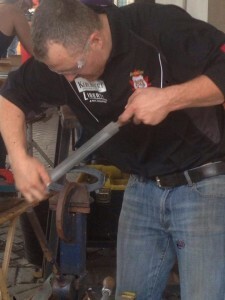 On day one we competed in the long shoeing class – 120 minutes. Johnny completed his individual class whilst the shoeing rounds went. 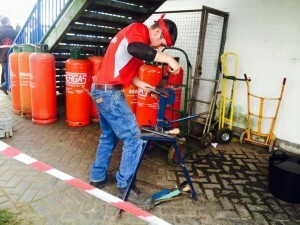 Shortly after they were over, the team headed outside to the propane station and completed the gas forging class; a shoe from each team mate to be completed in 90 minutes. The second day’s shoeing class was over quickly- it was a 90 minute plain stamp shoeing. The banquet was held that same evening, where we enjoyed a good meal and a chance to reflect on the happenings of the week. In the end, we earned two fourth places and seventh overall; a result we were happy with. 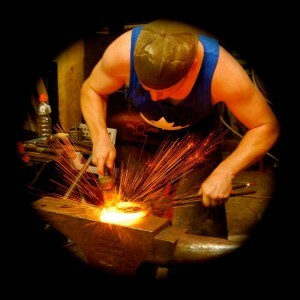 Thank you to Farrier Product Distribution for their support of the Canadian Farrier’s Team! Dan Corkery, CJF practicing for Stoneleigh. L-R: Travis Buck, Randy Brassard, Sara Vanderpol, Johnny Edwards, and Dan Corkery.